When using the knit leader you do not have to match the given tension or gauge for a published pattern. See later post for some guidelines in knitting gauge swatches. Vertical control: before you can shift gears you must depress the clutch. Testing for accuracy: set the row regulator to 150 mm and turn the knob 20 rows. The mylar should move the distance between 2 heavy lines, 5cm or app 2 in. 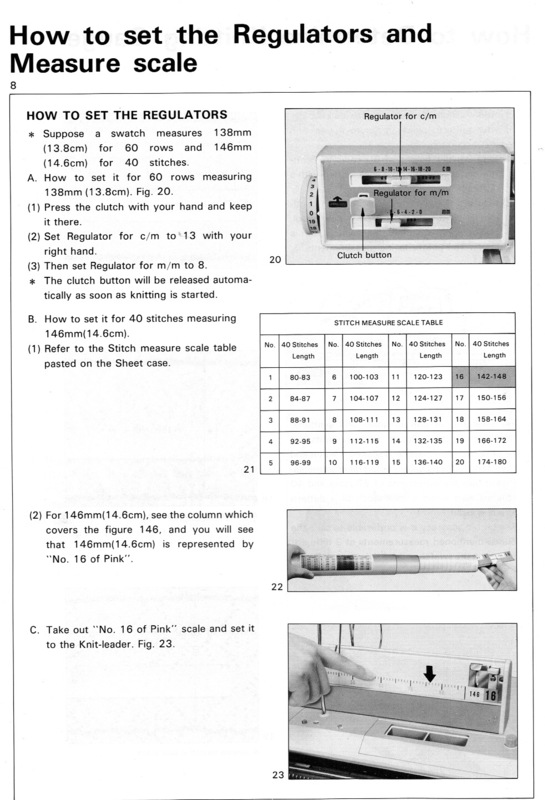 After measuring your swatch: draw a small horizontal line on the mylar sheet, followed by a vertical one to match cm +mm measurement for 60 rows, and a small horizontal one again, air knit 60 rows, beginning at the bottom mark, and at their completion the top mark should be reached. For ruler accuracy: there should be exactly 40 stitches between 0 and 40, lining up the tape on your swatch stitches and corresponding lines should match. If they do not, select another ruler close in range, until they do. The pin is usually set in the feeding lever in the hole on the left. The hole on the right is used when the length of 60 rows is less than 6.0 cm, which can occur in textured stitches such as tuck and slip. In such cases the row measurement is doubled, and the pin is inserted in the right side hole. 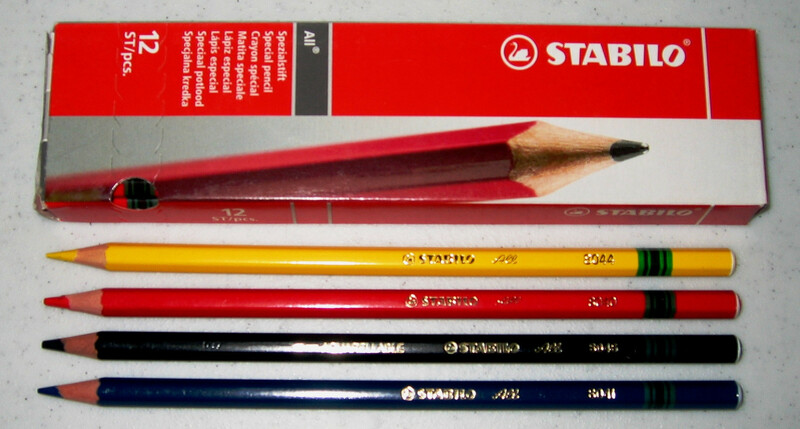 Using it on the bulky: make swatch as directed. 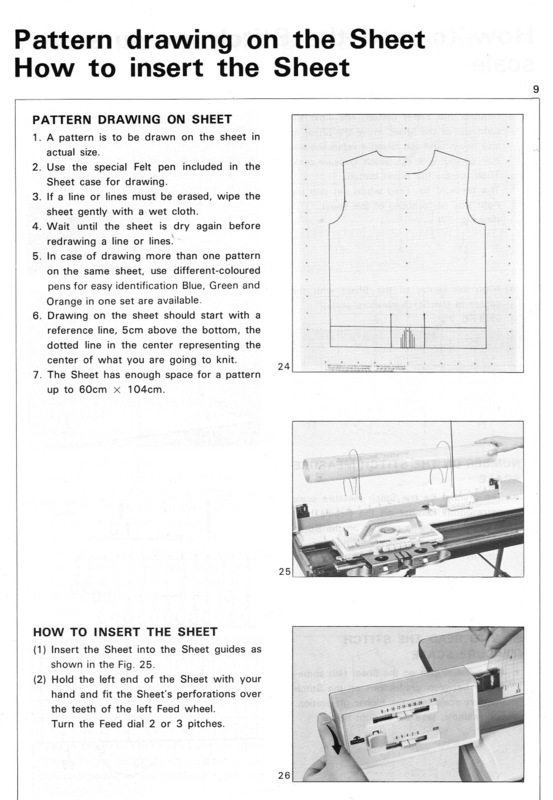 The bulky machine included stitch rulers when purchased new. There are 2 gauge numbers on each corner instead of 1. Every 20 stitches and 30 rows should match the numbers used for measurements. With the pin placed on the left hole of the feeding lever the arm will be tripped twice with each pass of the carriage. The shorter tripper on the back left of the knit carriage trips it once, the longer row counter tripper on the right also trips it on the travels from one side to the other. Using half scale patterns on brother’s full scale knitleader. Make the usual 40 by 60 row swatch (on the bulky 20 X 30 rows), or your preferred size and adjust measurements accordingly. 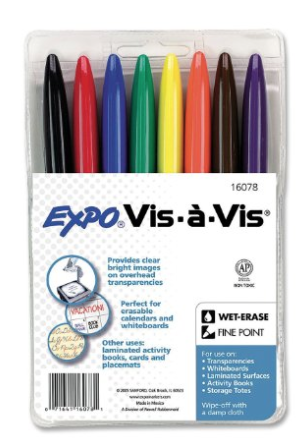 Measure swatches with any centimeter ruler. 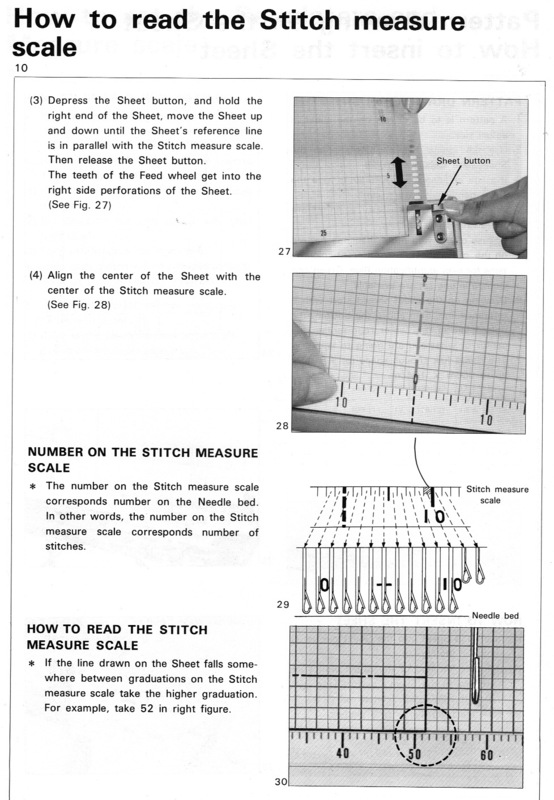 The stitch gauge: 1: follow outline but double the number of stitches indicated at all times, or 2: purchase a set of studio half scale rulers and the accompanying “green ruler”. The S side of the ruler is used to measure stitch swatches over 20 stitches. The number just inside the right marker corresponds to the number of the correct stitch scale to be selected from the set. Each mark indicates one stitch. Measurements are based on 10 cm (4 inches). Plastic rulers need to be taped into position. If there is a handy copier, paper tapes can be constructed and placed/adjusted to suit, after checking on accuracy of reproduced scale. For the row gauge: On the knitleader the central peg is normally put in the left hand of the 2 holes on the plastic fingers in the front. If you put it in the right hand hole however, the chart only moves every 2nd row, which balances out the 1/2 scale in length. 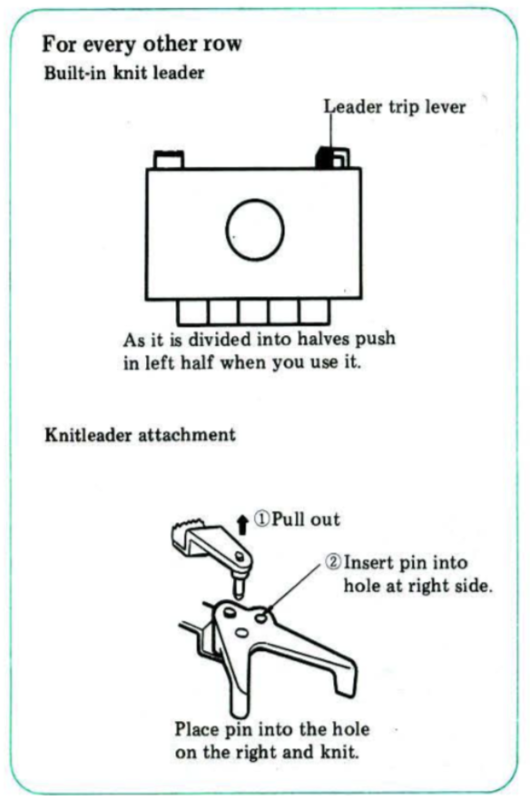 Program as always, setting cm and mm after pressing the clutch, but drop the connecting pin into the right hole of the feed lever. Every other needle knitting: measure the swatch in the usual way, divide it by 2, and count every other line as a stitch, or use a ruler that factors in the number of needles as “stitches” before needles were put out of work. If the row count is higher than the highest number available on the regulator, divide the total by 2, and draw the outline half scale. I like to measure a large swatch, and get my final measurements via math to the second decimal point. It is possible on my model to shift tape to change the center 0 postion. For sideways knit or wide pieces tracings of rulers can be made with 0 marking at the far left or right as needed. My math starts out with measurements to the second decimal point, rounded off up or down at the last possible minute. The mylar sheet may be turned over, shiny side up for use in asymmetrical shapes that need reversing / do not have a central axis. Drawings on mylar may be followed for colored intarsia, or intarsia weaving. 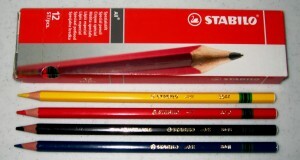 Studio gauge rulers: depending on your machine, there are different numbers of stitches and rows marked. For 4.5 standard guage you need to isolate 40 stitches and 60 rows; mid-gauge needs 30 stitch and 40 rows; and the bulky needs 20 stitches and 30 rows. To use the rulers: one side has an “S” and the other side has an “R” marked on it. Place the gauge ruler with the “S” side up to measure stitches. Place the cut edge of the ruler is against your chosen markings for stitches. Where the edge of the yarn marks lay, note the number. This is value for the stitches in 4 cm. Flip the gauge ruler over to the “R” or rows side and place it vertically to measure rows. Place the cut edge and the bottom of the first stitch in main color yarn. Look up to the top where the main color yarn meets the contrasting yarn row, This is the value for rows in 10 cm or 4 inches.